One of the primary triggers of the outbreak of World War I was undoubtedly the myriad alliances and suspicions that existed between the Russian, German, and Austro-Hungarian empires in the early 20th century. Yet much of the actual fighting between these nations has been largely forgotten in the West. Driven by first-hand accounts and detailed archival research, Collision of Empires seeks to correct this imbalance. The first in a four-book series on the Eastern Front in World War I, Prit Buttar's dynamic retelling examines the tumultuous events of the first year of the war and reveals the chaos and destruction that reigned when three powerful empires collided. A war that was initially seen by all three powers as a welcome opportunity to address both internal and external issues would ultimately bring about the downfall of them all. 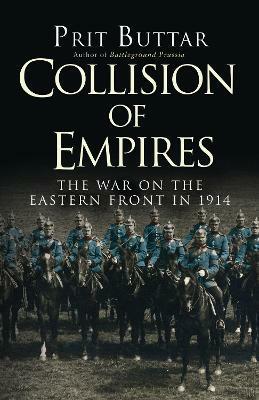 "Based in archival research, this book will appeal to readers interested in World War I and especially the first months of battles on the Eastern Front." "--Library Journal"
Prit Buttar studied medicine at Oxford and London before joining the British Army as a doctor. After leaving the army, he has worked as a GP, first near Bristol and now in Abingdon. He is extensively involved in medical politics, both at local and national level, and served on the GPs' Committee of the British Medical Association. He appears from time to time on local and national TV and radio, speaking on a variety of medical issues. He contributes regularly to the medical press. An established expert on the Eastern Front in 20th century military history, Buttar has published two books focusing on the Second World War, and Collision of Empires is the first of a planned four-volume series, the definitive study of the First World War on the Eastern Front.